There are not much choices among the tablets with 3G calling and Jellybean under the price range of 10000 INR. So, adding to the same segment Simmtronics has launched a new tablet with the display size of 7 Inches and Jellybean (Android v4.2.2). The tablet is named as Simmtronics XPad Turbo and it supports all three features of 3G calling, Jellybean and available at the price of 8056 INR. Let us talk about the specifications of this device in detail. One thing which may disappoint you is the battery strength which is just 2800 mAh, capable of providing you with the 4 hours of continuous browsing and 3 hours of video playback. The memory allocation on the device is 512MB DDR3 RAM (DDR3 is good for a device at this price) along with 4GB of internal memory and extension ability up to 32GB with the help of microSD slot. 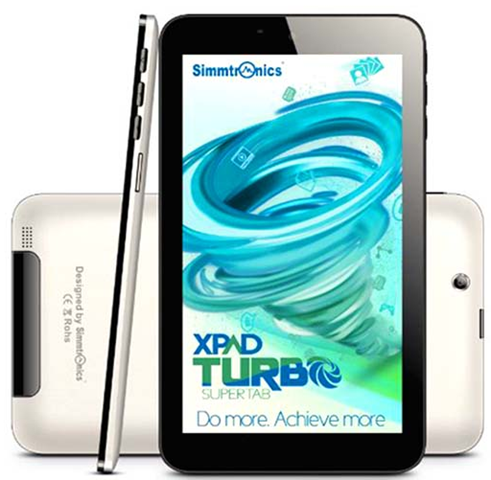 Simmtronics XPad Turbo has got 2 SIM slots, wherein one is available with 3G connectivity but the other is not. So, Dual SIM is also an added advantage for these devices. So, these are all the hardware on paper specifications available for this device which are decent looking at the other devices available at the same price. You can buy Simmtronics XPad Turbo from Snapdeal and please let us know if you have any confusion while buying this device.